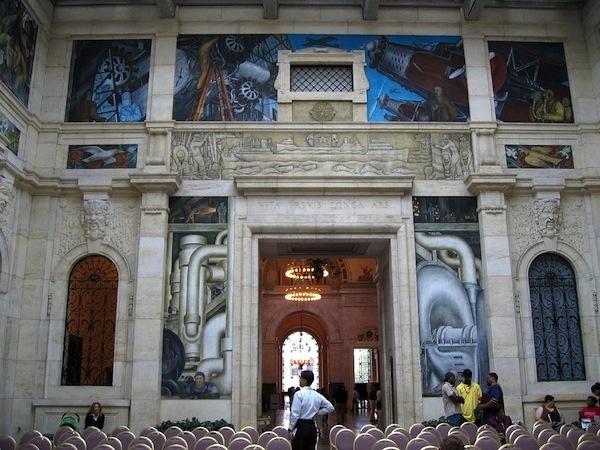 When the Mexican artist Diego Rivera arrived in Detroit in 1932 to paint these walls, the city was a leading industrial center of the world. It was also the city that was hit the hardest by the Great Depression. Industrial production and the workforce were a third of what they had been before the 1929 Crash. Rivera arrived days after an infamous Hunger March where thousands of unemployed workers walked from downtown Detroit to the gates of the Ford Motor Company River Rouge plant to demand employment. Armed Ford security guards met them, panicked, shot into the marchers and killed six people. This confrontation became known as the Battle of the Overpass. 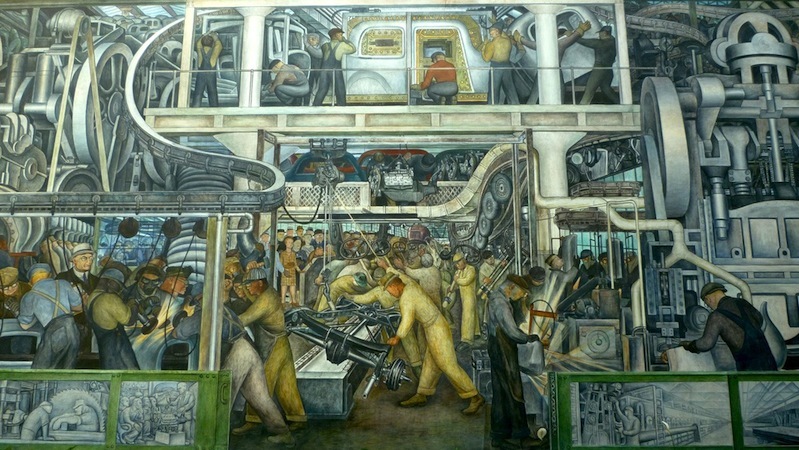 The workers were shut out of the Ford factories, but Rivera put them to work in the heart of the museum. The space he was given to paint was aligned on an east/west/north/south axis. Rivera utilized this architectural orientation in a symbolic way. On the east wall, the direction of the sunrise, beginnings, new life, he represented a child in the bulb of a plant cradled by two plowshares and framed on either side by hefty nudes holding grain and fruit—symbolizing bountiful harvests. These panels introduce some of the world’s earliest technology in agriculture. The manufacture of the 1932 Ford V-8 at the Ford Motor Company’s River Rouge plant is captured in the two major panels on the north and south walls. 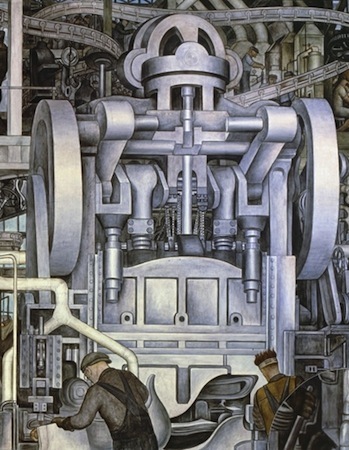 On the north wall, the direction of darkness, and the interior of things—Rivera captured all the processes related to the assembly of the motor. The blast furnace glows orange and red at extreme temperatures to make molten steel that is poured into molds to make ingots that are then milled into sheets. All the major processes related to the manufacture of the motor of the car from mold-making in the upper left to the final assembly of the motor on the assembly line in the foreground are accurately rendered with engineering precision. The artist wove the processes together through the use of the serpentine conveyors and assembly lines. The composition is grounded by two rows of white milling machines that stand as sentinels in the center of the wall and march into the background to the blast furnace. On the south wall, the wall of light, the exterior of things, Rivera painted the assembly of the body of the car on the south automotive panel. The parts stamped out at the stamping press on the right then are welded in the welding buck in the upper center. Surrounding this image are painting, upholstering and the final assembly where the chassis is joined to the body. At the end of the assembly line is a finished tiny red car. The only machine that has been slightly altered is the stamping press because Rivera saw in it a resemblance physically and symbolically to the famous and feared ancient Aztec statue that was believed to have caused death and destruction when it was unearthed in Mexico City in the 18th century. It is now known as the representation of Coatlicue, the creation goddess. Cuatlicue was both a creator and destroyer of life. She was fed human hearts in order to maintain the order of the universe. The Coatlicue/stamping press presides over the sacrifice of workers through repetitive and physically demanding factory jobs. On the upper north and south panels Rivera painted gigantic red, black, yellow and white figures symbolic of the diverse workforce. Each has one of the raw materials that form the basis for the automobile industry—iron ore, coal/diamonds, sand and limestone. Rivera attributed the tensile strength of the raw materials with his conception of the character of each race. The red race he associated to iron ore; the black race to coal and diamonds; the yellow race with malleable sand; and the white race with the building material of limestone. The west wall, the direction of sunsets, endings, and last judgments, Rivera painted passenger planes and bombers. Here the constructive and destructive uses of technology are clearly presented. The panels below the planes depict a dove and a hawk to underscore the theme. The most controversial panel in 1932 was this small right hand panel on the north wall. Here a child is vaccinated in a medical laboratory surrounded by the animals that provided the serum. Rivera took this composition from Christian nativity scenes where the baby Jesus is attended to by Mary and Joseph and honored by three wise men. To Rivera, medical technology would be the new savior of mankind. He based the image of the child on the kidnapped Lindberg baby, Mary is based on the popular movie star of the time, Jean Harlow, and the doctor is a portrait of the museum director, William Valentiner. The three scientist/wise men he referred to as a Catholic, Protestant and a Jew—ecumenical wise/medical men. 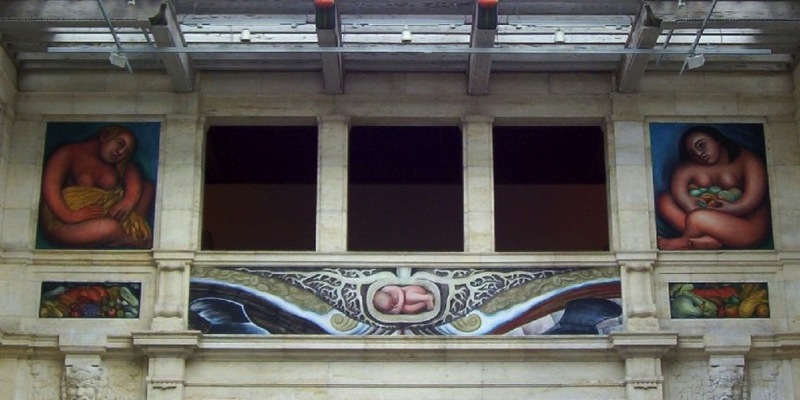 A major controversy was sparked when the murals were publicly unveiled. Thousands of people signed petitions to either destroy or save them. The Catholic Church sparred with factory workers and college students and the press wrote articles for weeks. The museum held public speak-outs. 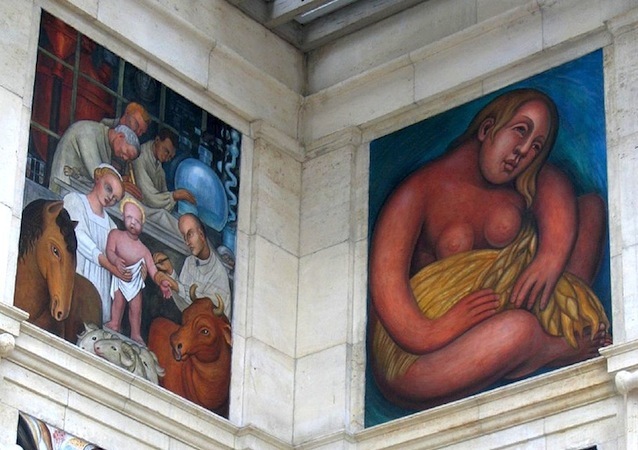 The Detroit City Council considered a vote to whitewash them. In the end Edsel Ford publicly accepted them for the museum collection. 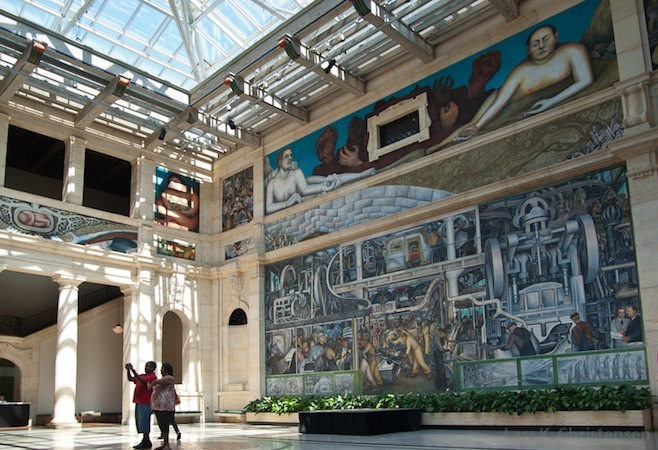 The Detroit Industry murals remain today one of the most engaging, major modern works of the twentieth century. 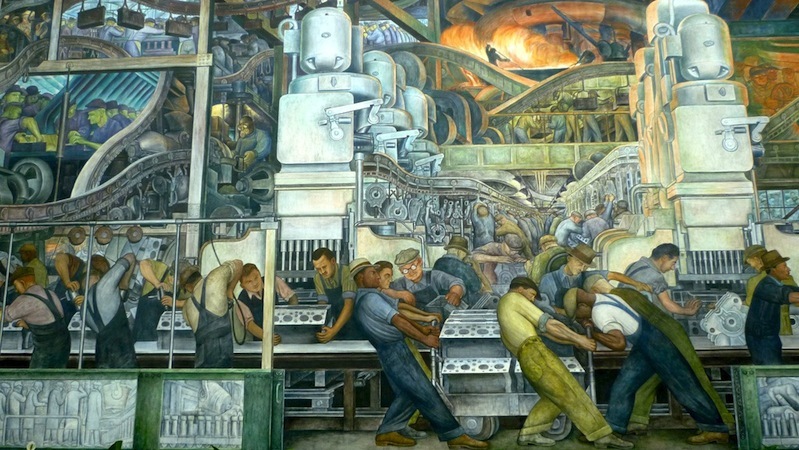 Cite this page as: Linda Downs, "Diego Rivera, Detroit Industry Murals," in Smarthistory, August 9, 2015, accessed April 22, 2019, https://smarthistory.org/rivera-detroit-industry-murals/.